South African amazing batsman Hashim Amla who is in great form from last few months and making Centuries after Centuries have come down to 4th ICC Ranking from 25th after series against West Indies. 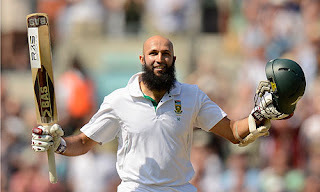 Hashim Amla made three Centuries in this series and was also declared man of the series. Hashim Amla is 27th Year old Left handed batsman who is a very religious person. Hashim Amla is in great form so he will be now looking the 1st ICC Ranking place on which now is Indian batsman Virendar Sehwag. Now Hashim Amla is on 4th Position in ICC Ranking that is his Career best Ranking. South Africa has lost Cricket to come up ahead this year and there is Golden Chance for Hashim Amla to come on First Position in ICC Rankings.